(NaturalNews) The appetite-regulating hormone leptin may actually be able to reverse the high blood sugar that characterizes type 1 and type 2 diabetes, according to a study conducted by researchers from Yale University and the Howard Hughes Medical Institute, and published in the journal Nature Medicine. Type 1 diabetes is an autoimmune disease in which the body attacks the cells that produce the blood-sugar-lowering hormone insulin. 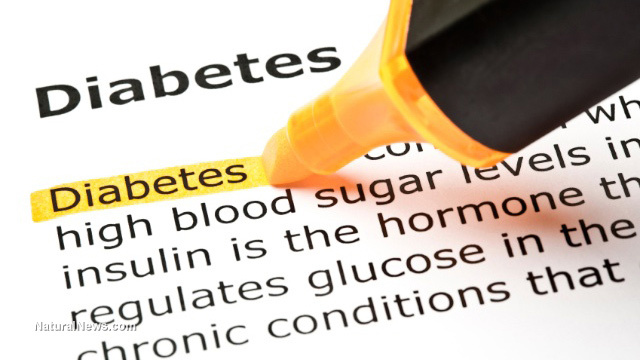 Type 2 diabetes is a condition in which the body becomes less sensitive to insulin. Both conditions result in elevated blood glucose levels. The researchers found that leptin suppressed neuroendocrine pathways responsible for causing blood sugar levels to rise in the first place. The study was funded by the National Institutes of Health, the American Diabetes Association and the Novo Nordisk Foundation for Metabolic Research. Twenty years ago, researchers discovered that leptin acts on the brain's nerve cells (neurons) to regulate appetite and metabolism and -- by extension -- weight. Research has shown that, in healthy animals, food intake causes fat cells to produce leptin, which then produces effects on the hypothalamus in the brain. The hypothalamus, in turn, produces a cascade of effects that lead to appetite suppression. Animals lacking leptin or leptin receptors have been shown to become severely obese due to constant overeating. Recently, the Yale and Howard Hughes researchers discovered that rats with poorly controlled type 1 and type 2 diabetes had lower than normal concentrations of leptin. In addition, they had lower blood levels of insulin and higher levels of the stress hormone corticosterone (which tends to increase blood sugar levels). In a follow-up study, they found that, when rats with type 1 diabetes were given an infusion to bring their leptin back up to normal levels, blood sugar levels dramatically decreased. In the presence of more leptin, the liver did not convert as much protein or lactate into glucose. The researchers discovered that leptin produced this effect by inhibiting the hypothalamic-pituitary-adrenal axis, a neuroendocrine pathway that helps regulate a number of bodily processes, including energy storage, energy use and stress response. "Previous studies by our group found that leptin replacement therapy reversed diabetes and insulin resistance in patients with severe lipodystophy -- a loss of fatty tissue that leads to those disorders -- by reducing fat deposits in the liver and skeletal muscle," senior author Dr. Gerald Shulman said. "These new data provide an additional mechanism by which leptin therapy reverses hepatic insulin resistance and hyperglycemia in animal models of poorly controlled type 1 and type 2 diabetes." Another recent Yale study also revealed new functions of leptin in a paper published in the journal Nature Neuroscience on June 1. The researchers found that, contrary to prior belief, leptin regulates metabolism by acting not just on the brain's neurons but also on another type of brain cell known as glial cells. "Up until now, the scientific community thought that leptin acts exclusively in neurons to modulate behavior and body weight," senior author Tamas Horvath said. "This work is now changing that paradigm." The researchers selectively removed leptin receptors from the glial cells of mice and then observed the animals' physical activity and food and water intake. The mice became less responsive to the appetite-suppressing effects of leptin but more responsive to the hunger-promoting hormone ghrelin. The researchers in both studies expressed hope that a new understanding of leptin could lead to therapies for various chronic health conditions. "Glial cells provide the main barrier between the periphery and the brain," Horvath said. "Thus glial cells could be targeted for drugs that treat metabolic disorders, including obesity and diabetes."